Marin County chiropractor Dr. Don Harte has provided specific, science-based chiropractic care to Marin County and the San Francisco Bay Area since 1981. Over the years, his passion has grown deeper and his practice member community has expanded wider. 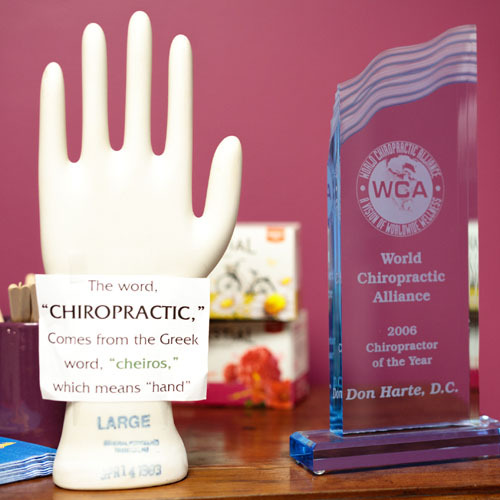 In a world of many chiropractors, Dr. Harte offers something special – authentic chiropractic performed with passion. He views the body as an intelligent temple with the ability to heal itself, and for this reason, he believes in the art of adjustment rather than the act of manipulation. His work is based upon the certainty that the body does not need to be fixed; it simply needs to be freed to perform at optimum capacity. Through his gentle, individualized chiropractic plans and adjustments, Dr. Harte will identify the cause of your discomfort and work diligently to correct any interferences with your body’s natural processes. According to Dr. Harte, everybody with a spine can benefit from adjustment. His ultimate hope for his practice members is that they get well and achieve as close to 100% health as they possibly can. From the first call, he is concerned about you – asking about your main health concerns and what medications you are currently taking. From there, a thorough examination is conducted, a full analysis is completed, and a personal care plan is formulated and shared. Dr. Harte believes in chiropractic health on a lifetime wellness basis, and he is more than happy to help you choose a care package that works best for you. Your chiropractic evaluation is centered upon the detection and analysis of Vertebral Subluxation Complex (VSC), the interference to your nervous system. This includes spinal x-rays to pinpoint what is “out-of-place,” and two types of nerve scans to assess the function of your nerve system. Dr. Harte’s main chiropractic technique is Directional Non-Force Technique, which allows him to adjust spinal disks, the jaw, and extremities, including the knees, hips, shoulders, etc., as well as the spine. Other techniques he uses are the Upper Cervical Specific, Logan, Applied Kinesiology and Columbia. Get to know more about how our practice can help you by contacting us to book your first appointment. We can’t wait to meet you on your journey to true health.